There are a number of ways to rank the importance of blogs, like for example measuring inbound links via Technorati. PubSub today launched a new tool called LinkRanks for tracking a blog’s inbound links the last 30 days. 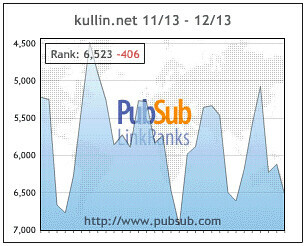 LinkRanks calculate a site’s current ranking among all blogs that PubSub tracks. Media Culpa is currently ranked 6,523 which is in the top 0.1 per cent of all seven million blogs that PubSub tracks. UPDATE: Håkan Kjellerstrand has a list of several Swedish blogs and how they rank on LinkRanks.